Cool sophistication in breezy Palm Beach! 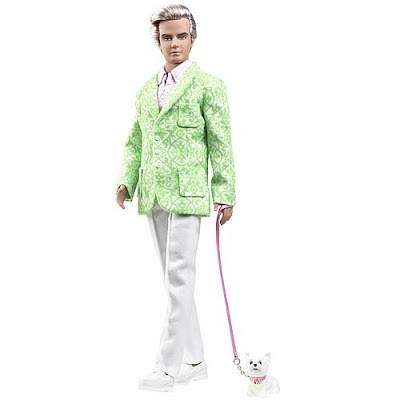 Sporting a dashing jacquard-patterned jacket with a light pink polo shirt and crisp white pants, Ken doll is ready for Palm Beach social season, sunning by the pool and a stroll with his little companion. Fashion designed exclusively for the Silkstone Barbie doll body. Includes Ken doll, jacket, pink polo shirt, white shoes, dog with leash, swim trunks and accessories, doll stand and certificate of authenticity. For the adult collector. awesome. a new way to be creepy. is a bladeless fan still a fan? wednesday comics is going HARDCOVER!